Will Alfred’s dream of a united England survive? Is The Last Kingdom TV show cancelled or renewed for a fourth season on Netflix? The television vulture is watching all the latest TV cancellation and renewal news, so this page is the place to track the status of The Last Kingdom season four. Bookmark it, or subscribe for the latest updates. Remember, the television vulture is watching your shows. Are you? A BBC and Netflix historical drama, The Last Kingdom stars Alexander Dreymon, David Dawson, Emily Cox, Tobias Santelmann, Harry McEntire, Joseph Millson, Björn Bengtsson, and Ian Hart. An adaptation of Bernard Cornwell’s novel series, The Saxon Stories, the historical drama follows Uhtred of Bebbanburg (Dreymon), the son of a 9th Century Saxon nobleman. After killing his father, Danish invaders kidnap the boy and he is raised by their warlord, Ragnar. Years later, when Ragnar is killed, Uhtred vows to avenge him and reclaim his birthright. In season three, both King Alfred’s (Dawson) health and his dreams of a united England are fading. 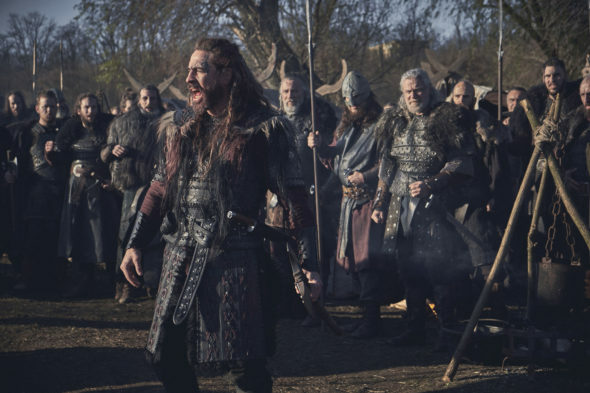 Meanwhile, Uhtred must take command and confront a new threat — Danish warlord Sigrid (Bengtsson). The Last Kingdom has been renewed for a fourth season which will debut TBD. Stay tuned for further updates. Will BBC and Netflix cancel or renew The Last Kingdom for season four? It’s tough to say, because we only have access to Netflix TV show “ratings,” if they decide to release them. Since this series is a co-production between the UK and US companies, that further complicates things. For now, I’ll keep an eye on the trades and update this page with breaking developments. Subscribe for free Last Kingdom cancellation and renewal news alerts. 12/26/18 update: Netflix has renewed The Last Kingdom for a fourth season. Details here. Review ratings for other network TV shows. Find more The Last Kingdom TV series news or other Netflix TV show news. What do you think? Should The Last Kingdom TV show have been or renewed for a fourth season? How would you feel if they had cancelled this TV series instead? I am on this ride till the very end. The strory is gripping and once you begin you wont want it to end. Season 4 and more needs to happen. I know Netflix has lost traction with Disney and shows like this will keep me subscribed. I am a Bernard Cornwell fan and have read all the Saxon Tales books. I love The Last Kingdom and find it very true to the books. Omg! Im in love with the character Uhtred. We clicked on it thinking it was a movie and Bammm were were stuck. Im dying of the await of season 4. Please hurry!!! I didn’t think I would like this show at all but now that I have finished season 3 I want season 4 now. If you didn’t continue the show I would be highly disappointed because it has a great plot and characters in the show. I honestly wish I could have lived in those days. I seriously hope your in the making if not finished with season 4. This is the best netflix original I have seen so far. I would say that is easily rivals game of thrones on HBO, I think it is even better actually since it is way more grounded in the real world than that of fantasy. If this show were to be cancelled I’d be really disappointed, there are so many great characters that I’ve been watching develop as the episodes progress, plot lines that I want to see the ending to and so much more. Definitely my favorite show at the moment, please netflix keep them coming! Thyra’s murderer, Tidman, dies from stab wound from Thyra. His weight on the floor boards traps Thyra…tragically… in burning house. She stabs herself with the same knife, rather than burning to death. Me and my wife love this show !! We hope Utrids story makes it to a season 10 and after ! The story isn’t over !! Far from it!! Destiny is all!! My husband and really like The Last Kindom. We hope they produce season 4. We will watch it for sure! My husband and I got hooked on this story. We repeat “I am Uhtred, son of Uhtred” at every episode. Please say season 4 is coming! Uhtred’s story is not complete. Destiny is all! !